Mary was a studious kid and wasn’t interested in sport. After college, she joined the IT department of Price Waterhouse Cooper becoming a management consultant. She spent a lot of time in London, and friends introduced her to running. Mary ran long distance throughout her thirties, completing over 45 marathons, and some ultra-marathons. In 2006, offered a career break, she moved to Ireland and worked under contract for three days a week. 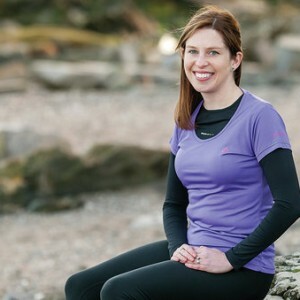 She started writing a bi-weekly column for the Irish Times after the success of the ‘Get Running,’ online coaching programme she’d set up for the paper. This gave her the confidence to approach publishers with her book proposal. Date of birth: 1977, in Dunboyne. Family: Husband John, and son Harry, 2. The Day Job: Chi Running Instructor with ForgetTheGym. Columnist for the Irish Times. Second Novel: There’s nothing planned. The training guides, motivational tips, runner’s stories, and pictures in this wonderful book, provide encouragement for anyone who wants to get out and give running a go. The Verdict: The best running book ever! Comprehensive, inspiring and beautifully produced. Published in The Irish Examiner on 9th March.